Governor Setup – Welcome to the EMIT Technical Forum! 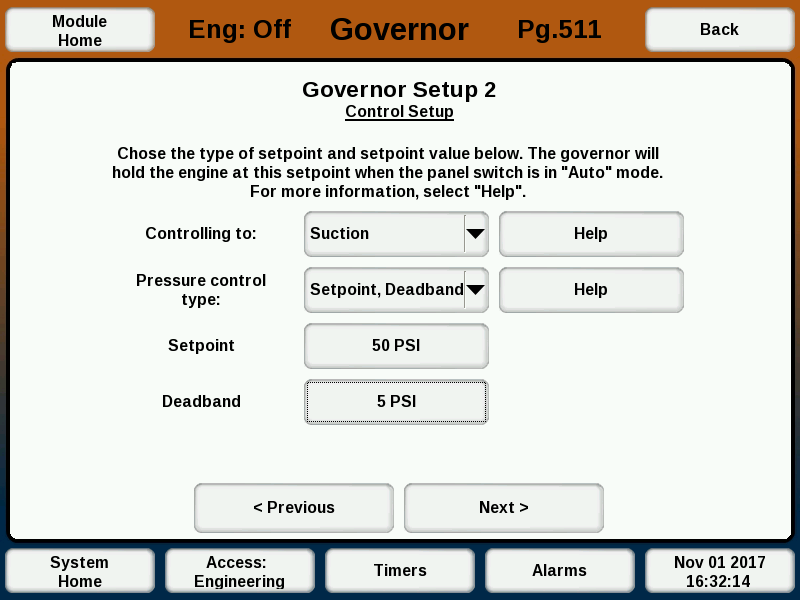 After initial install, or when settings changes are needed, the Governor setup screens are used. The setup screens are accessed by selecting “Setup” on the Governor Home screen, then the “Governor Setup” button. An access level of Setup or higher is needed to access these screens. 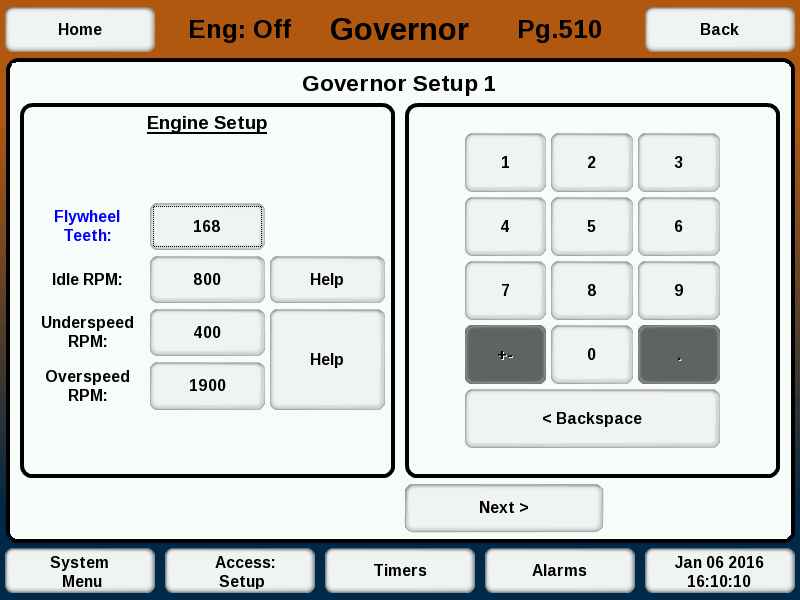 Step 1 of governor setup specifies the basic engine settings. These are the number of flywheel teeth, the idle speed for when the panel switch is in “Idle”, and the speed alarm values. After initial setup, these settings are not commonly changed. If an underspeed alarm is not needed, it can be set to “0”. The speed alarm will always shut down the engine regardless of the control mode or condition. If an RPM setpoint higher than the overspeed alarm is specified, the setting will be allowed, but once the engine hits the overspeed value it will be shut down. In step 2 of the governor setup, the setpoint type and value are specified. For the fixed speed control type, the setpoint is an engine RPM. For suction or discharge control, the setpoint is a PSI value. If fixed speed control is selected, the setup will skip to Governor Setup Review after this step. For pressure control modes, the control type can be "Setpoint, Deadband" or "Linear Ramp". (Note: Linear Ramp mode requires software version 848 or newer). Setpoint, Deadband: In this mode, a pressure setpoint and deadband is given. If the pressure is outside of the range [Setpoint +/- Deadband], the speed will change (with the direction depending on if it is suction or discharge control). Within the deadband, the speed will not change. The speed will increase or decrease only until the speed hits a range limit, given on the next setup page. In the above example, if the current suction input pressure is 25 PSI, the RPM target will be 1400 RPM. If using a pressure control mode (suction or discharge), step 3 will specify some additional settings. The High and Low Auto RPM specify the operating range of the engine while controlling to the specified pressure. The Governor will not let the engine out of this range, even if the pressure is still too low or high. This is separate from the over- and underspeed alarms mentioned earlier, which specify the absolute min and max speed for the engine. The response rate determines how fast the Governor will ramp up or down the RPM when in a pressure control mode. The default is 50 RPM/s. A lower value will result in less tight control, but more stable operation because the engine will ramp more slowly. Note: Generally, for suction control the response rate can be lower, since a well (or upstream supply) changes pressure so slowly. For discharge control, the response rate is usually higher. If using pressure control mode, this step specifies the low and high specification of the sensor. The low value is the pressure that causes the sensor to output 4mA. The high value is the pressure that causes the sensor to output 20mA. These values should be printed on the sensor itself. For example, a suction sensor might say “4-20mA output for 0-100 PSI”. In this case enter “0” for the minimum PSI value and “100” for the maximum PSI value. If only one sensor type is used, the other can be left unchanged. Note that this step is skipped if an EMIT annunciator is present, because the sensor will be set up and wired to the annunciator instead. The setup summary page shows a summary of all the selected settings for the Governor. If the page looks correct, the “Submit” button can be pressed to send the settings to the Governor.